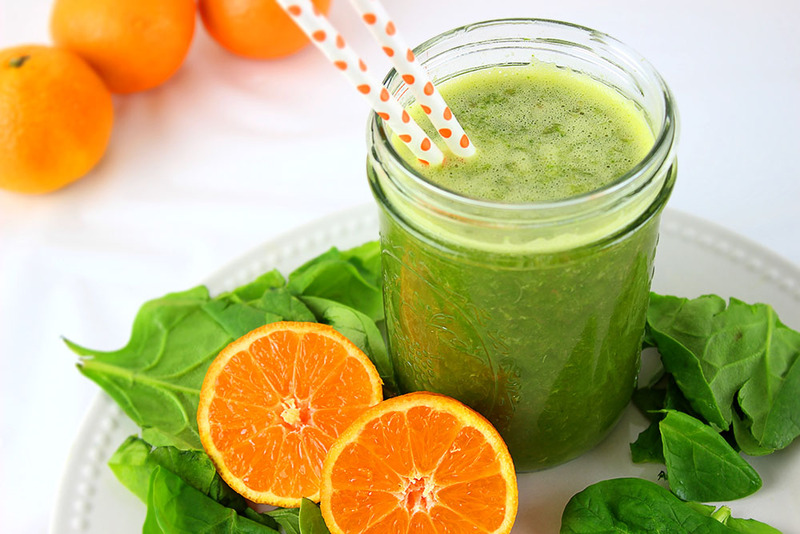 This Energy Blast Citrus Green Smoothie will give you the energy you need to get your day started. I drink Green Smoothies every morning. No joke. I love them. Personal story alert: I realized a while ago that I was taking in way more caffeine than I thought my body needed. I mean, it doesn’t need any but I craved it because I drank it often. I love me a Dr. Pepper or a Crystal Light Energy but I realized I was hardly going a day without caffeine. I cut myself off from caffeine (I still have it once in a while if I’m out to dinner or something) but I feel 100x better now replacing my caffeinated drinks with green smoothies. 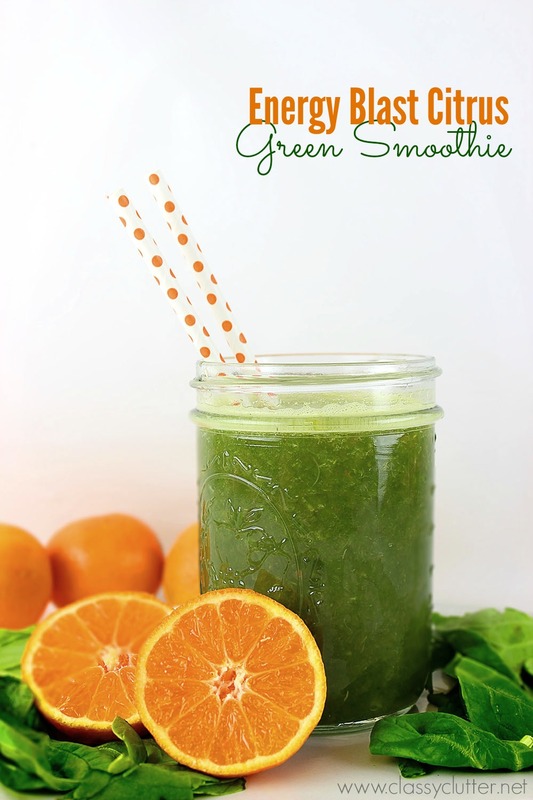 This is my “go-to” favorite green smoothie recipe. 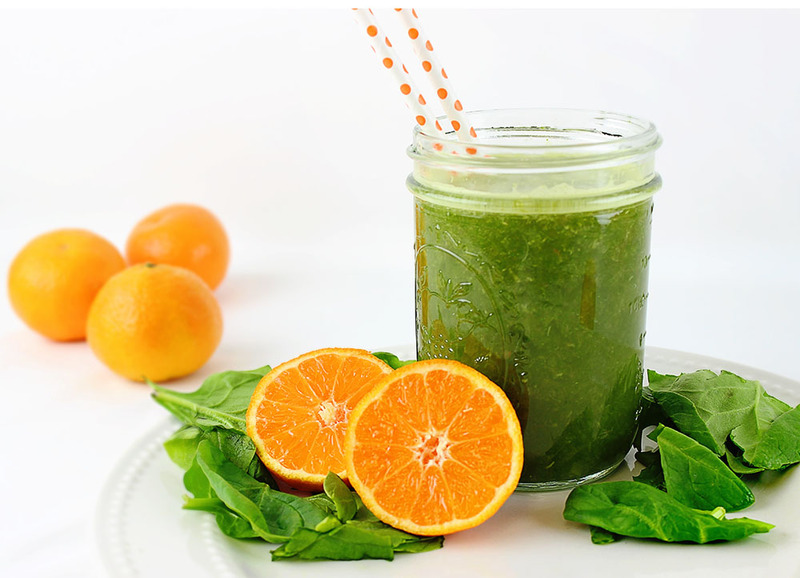 1 1/2 cups of water, orange or grapefruit juice. Combine all ingredients in a blender until smooth. I use a refurbished Vitamix, you can check them out here (affiliate link) and it works so well! Buying refurbished will save you a few bucks (like over $100 savings!) and you’d never know it was pre-owned; ours even came with a 5 year warranty. I highly recommend it! I use it 1-2x daily! It even grinds up the chia seeds and orange seeds so you don’t even notice them. This smoothie is more of a pulpy juice. It’s very grapefruit-y without being overpowering or sour. It’s so good!!! I have had it every morning for a couple weeks now and it gives me a ton of energy first thing in the morning. I usually make some scrambled eggs and I stay full well into the afternoon. I hope you try it! I think you’ll love it! I sure do! Caffeine is delicious, but it does not do your body good! I’ve gotten myself out of the habit of having it, but have had coffee the past two mornings (to use up the last of the coffeemate we had!) and it’s been horrible! Well, I mean, it tastes good, but I hate what it does to me, after being away from it! Smoothies, though, that I can get on board with! I may have to replace my coffee pot counter space with my blender! Thanks for the awesome recipe!! I too am a green smoothie fanatic. They are just SO good & even better for you. If folks would give them a chance – a REAL chance – they’d never go back to their morning coffee that just makes you jittery, then leaves you dragging when it makes you crash. Give me good, healthy, sustainable energy any day. Oh! By the way, thank you so much for the heads up on the refurbished Vitamix Blenders!!!!! I have been wanting one SOOOOO bad. I thought I’d never get one because of the high prices, so when I read the end of the smoothie recipe (where you talk about yours & how well it works), I literally started jumping up & down I was so excited!!!! You are the bomb-diggity girl!! (ha ha) Thanks again & have a very blessed day! do you peel the oranges? I’m sorry, I’m new to this! I only have a Nutra Bullet. Doesn’t this make a lot? Do you drink it all day? Or make several servings from this? Yes, I peel the oranges and this makes about 20-24 ounces of juice/smoothie. Hope that helps! I see that it makes 2-3 servings. Do you drink it all for breakfast (or through out the day) or split it with the rest of your family every morning? What kind of liquid do you usually use/recommend?